An Apple, A Boulder, A Mountain, 1921, one of Edward Steichen's most distinguished works, was made as he embarked on a radically new phase in his art. 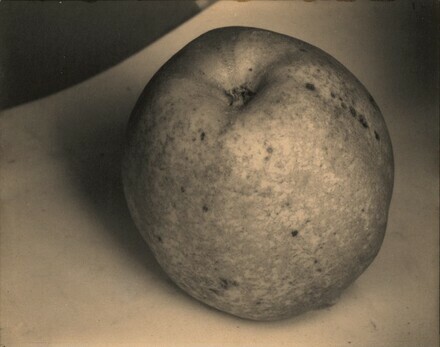 Abandoning his soft-focus, painterly style, Steichen examined the apple with a clarity unknown in his earlier art. By inverting the apple, much as Paul Cézanne had done, he emphasized both its formal and tactile qualities and showed how a small object, when seen in a new light, can assume the monumentality and significance of a much larger one. Steichen's early career was meteoric. Following an apprenticeship at a lithography firm in Milwaukee where he taught himself how to paint and make photographs, he exhibited his painterly photographs at an 1899 Philadelphia salon and was hailed by Alfred Stieglitz as the embodiment of the new fine art photographer. In the early 20th century as Stieglitz's protégé and collaborator, he moved between Paris and New York, where he made both paintings and photographs and established connections with such painters and sculptors such as Auguste Rodin, Henri Matisse, and John Marin. In 1905, he encouraged Stieglitz to open the 291 Gallery in New York and arranged for many of its initial groundbreaking exhibitions of modern European and American art. Yet their close friendship became strained before the outbreak of World War I when Stieglitz grew enamored of the Proto-Dada work of Francis Picabia and Marcel Duchamp; it ended during the war when Stieglitz voiced his pro-German sympathies and Steichen joined the U.S. Army Signal Corps. After the war, Steichen was depressed, uncertain about his future, and conflicted about the merit of his previous art. While convalescing in France, he saw the naïve paintings of his gardener and recognized that they had a "curious charm and direct simplicity" lacking in his own work. Abandoning painting, he decided to focus exclusively on photography and began a self-imposed apprenticeship to better understand the basics of photography and gain greater control over his negatives. After spending months photographing a cup and saucer to learn about light and texture, he began to address the question of how to express volume in his pictures. He decided to use very dim light and exceptionally long exposures. Yet he serendipitously discovered that because his exposures were so long—from six to 36 hours—the dramatic changes in temperature and humidity (from day to night and back to day again) caused the camera, film, and even the objects he was photographing to expand and contract slightly, all of which was recorded in his negative. With this breakthrough, he was "for the first time in a photograph able to sense both volume and form," he later said. He then experimented with methods of making his prints, and determined that either platinum or palladium paper gave him both a long, subtle tonal range and a softness that enhanced the appreciation of volume. An Apple, A Boulder, A Mountain, a stunning and exceptionally rare platinum print, is one of the most distinguished works from this series. His close-up scrutiny of a natural form closely links this photograph with works by other American modernist artists of the 1920s, such as Georgia O'Keeffe, Stieglitz, and Edward Weston, while its simple elegance predicts the best portraits and fashion photographs Steichen would make later in the 1920s. Carl and Lilian Sandburg; to their daughter Helga Sandburg; (Keith de Lellis Gallery, New York, around 1990 until 2014); (Charles Isaacs Photographs Inc., New York); NGA purchase, 2014.